The congregation of First Presbyterian was incorporated in 1840 and constructed a church building on the present Monroe Street location in 1847. The property was donated by Captain Obadiah Congar, a founder of the church and later, Mayor of Jacksonville in 1848. First Presbyterian was among the destroyed houses of worship in the Great Fire of 1901, but construction of the new and current sanctuary began in November of the same year. 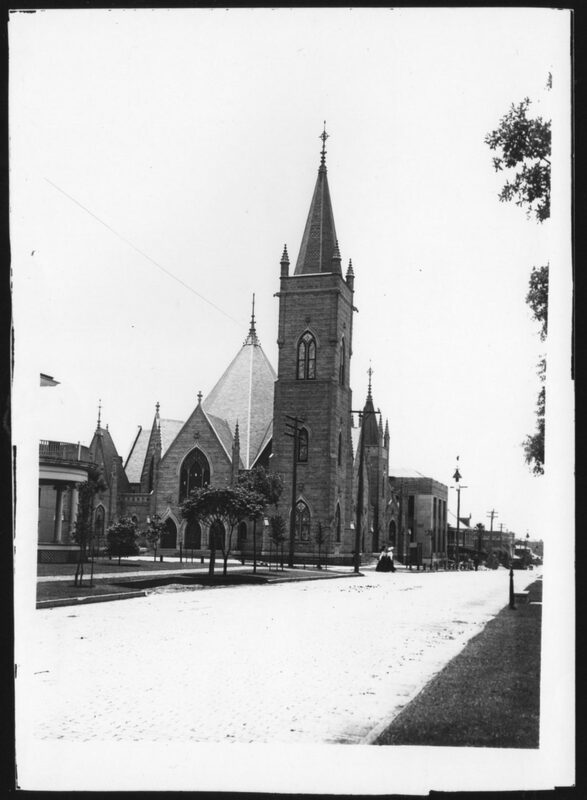 The congregation held its first church service on June 1, 1902. The church was built in the Gothic Revival style, using rough-cut Indiana limestone, with alternating courses of wide and narrow stones. The magnificent building features gargoyles atop the bell tower, lancet windows, buttresses and many other architectural flourishes. In 1927-28, the building was remolded and enlarged, with the roofline of the main sanctuary being changed from a six-sided conical shape to a steeply pitched ridge roof. On November 12, 2015, First Presbyterian celebrated its 175th Anniversary with an opening reception and permanent history exhibit initiated by Betsy Towers, exhibit chair, and Taryn Rodriguez-Boette of REALM Consultancy and Archivist at the Jacksonville Historical Society. To view the opening of this exhibit and much more, click here.